The Cattier Pink Clay Mask is a face mask that is designed for sensitive skin. It contains shea butter and peppermint oil to “restore, refresh and nourish” your skin. It also contains micro-nutrients to provide your face with radiance. 99.3% of the ingredients are also of natural origin. The Birchbox product info card also states that this mask can help you fake the look of 8 hours sleep - something that all mothers wish for! The mask is a dark pink and in some ways reminds me of calamine lotion. 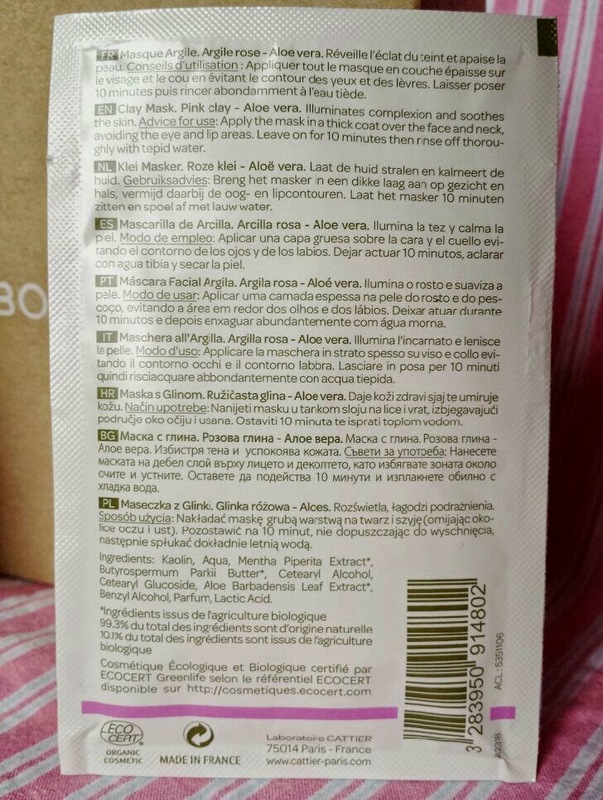 The full size product comes packaged in a white tube, but the sample provided in the Birchbox is in a white sachet and two are provided. To use, you need to apply a thick layer to the face for ten minutes and then rinse off with tepid water. The first thing that I noticed upon application was the instant cooling effect that it has on the skin that is down to the Peppermint Oil. It’s really refreshing so it is something that I do really like about it. Whilst trying to apply a thick layer onto my face, I found the edges where I hadn’t put quite as much on to be drying incredibly fast. This isn’t really too much of an issue though as it was just around the edges. I think that the faster and thicker that you apply it even around the edges, the less likely this is to be annoying. Once a thick layer has been applied, it isn’t so fast drying. After ten minutes most of the mask was dry, but some patches were still wet. I found it really easy to remove without any stubborn patches being left behind. It also washes easily out of a face cloth which I decided to use to help remove it, so there is no need to worry about potential stubborn pink stains! My skin was left really soft, smooth and brighter after removal. I was mainly concerned that it may leave my face feeling greasy as I wasn’t too sure if it was meant to be suitable for oily skin, but my face didn’t seem any more shiny than normal throughout my night time routine or after waking up. Also upon waking up, my skin did look a little more "awake," so that's a good sign for mums everywhere or generally busy women who can't ever get enough sleep! Overall I quite like this mask. It is refreshing and I like the way that it makes the skin feel. As well as feeling refreshed the skin also feels soothed. It’s really nice to calm down skin that can get easily irritated, so I would definitely recommend it to those with sensitive skin. 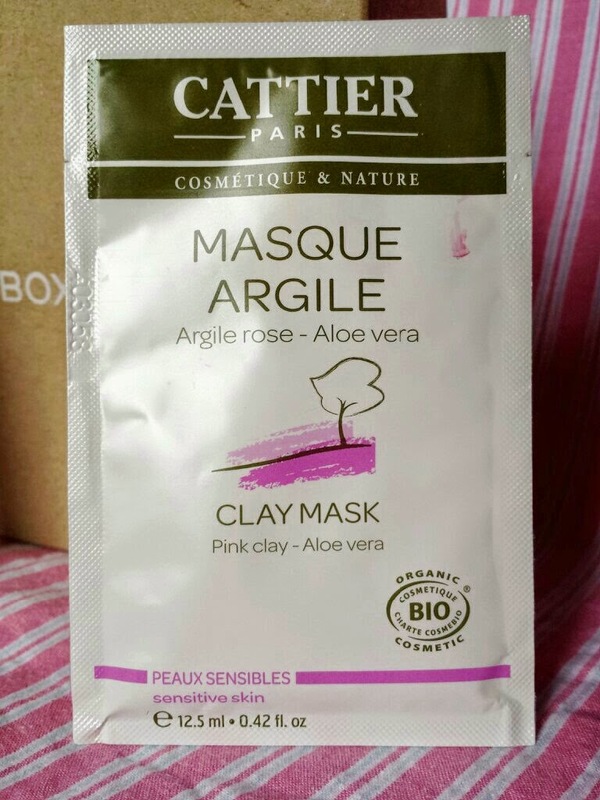 You can buy a full size, 100ml tube of Cattier's Pink Clay Mask for £4.25 from Birchbox. 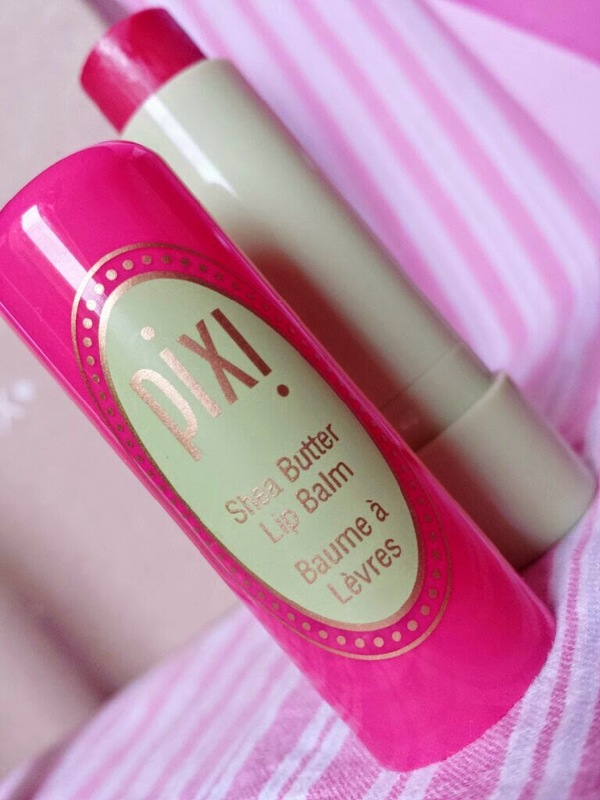 Pixi’s Shea Butter Lip Balm is a lightweight yet deeply nourishing balm that also provides a subtle hint of colour. It contains shea butter and Vitamin E to nourish and protect the lips and it comes in a range of six shades that include pinks and natural shades. 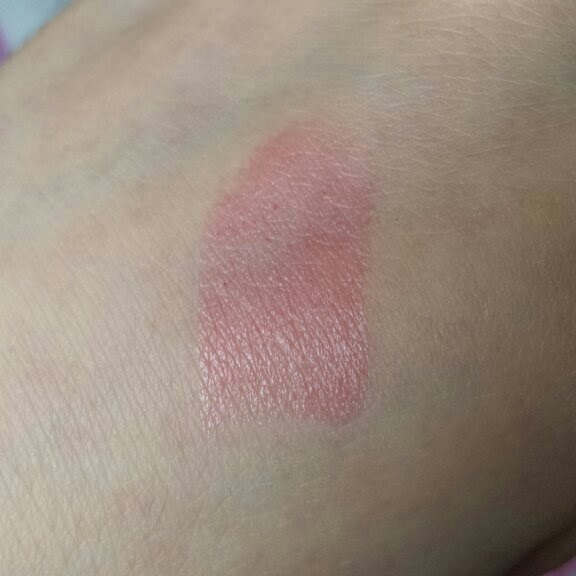 In my Birchbox I received the shade Ripe Raspberry which is a deep yet bright pink. The balm comes packaged in a green twist tube that has a lid shade to correspond with the colour of the product. Is it just me, or is it a thing that as soon as you open a new lip balm the first thing that is totally necessary to do is give it a good sniff? Well, that’s the first thing that I do, and I instantly noticed that this balm smells really sweet. It’s a candy floss sort of sweet, and I like it. The incredibly flat top to the lip balm can make it a little different to apply, but it glides on easily and smoothly with minimal effort. Upon application there is a slight hint of colour, but without it looking like you are wearing lipstick. 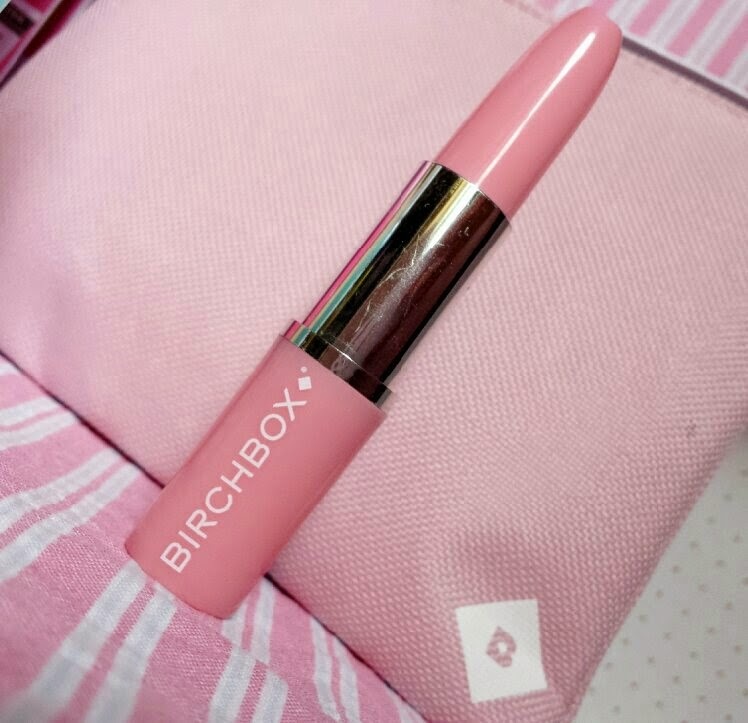 It also feels really soft and matte on the lips and non-sticky, so when combined with the subtle colour your lips feel comfortable and don’t look overly made up. It’s a great balm for casual day-to-day activities. As well as being casual, the softening capabilities of this balm make it a brilliant choice for the winter when dry lips become an issue. Even after removal the lips feel much better, so the effects are felt throughout the rest of the day too. One thing that I did notice is that due to the subtle colour, frequent re-applications are necessary as when it starts to fade it is noticeable! 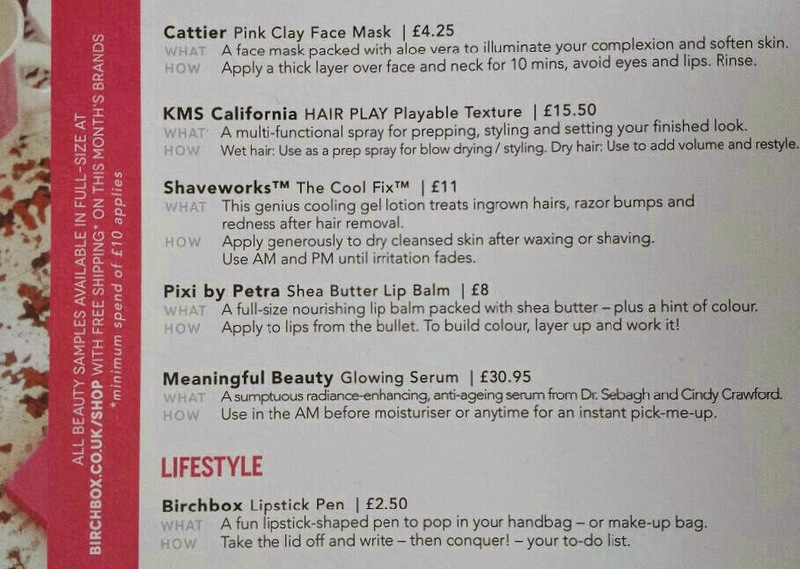 You can buy a full size, 4g tube of Pixi's Shea Butter Lip Balm for £8 from Birchbox. 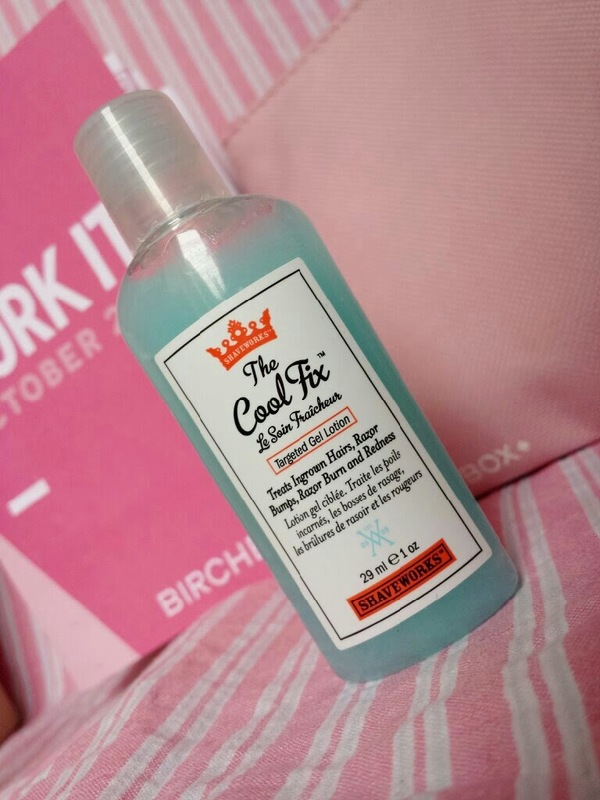 The Cool Fix is a bright blue cooling gel for post shave/hair removal that is designed to help combat razor bumps, burn and ingrown hairs. It contains glycolic acid, salicylic acid, phytic acid and a medicalm complex to soothe irritated skin. You need to apply the gel straight after hair removal when the skin is dry. When I applied this gel I was hit by an uncomfortable stinging sensation. It was one of those moments where you have to consider simply washing it straight off, but due to the purpose of the gel I decided to persist. Thankfully the stinging faded pretty quickly and no redness or irritation occurred. I did look it up later on in the day and whilst most people seem to agree that there should be no stinging sensation upon application, there are some people who have experienced it as well as myself. I'm not 100% sure why some people experience this, but do keep the fact that it is a possibility in mind if you give this a test! Over the day I have been keeping check and so far razor bumps and irritation has been kept to a minimum. However, it is difficult for me to give a true report back until I've given it some more time. Therefore, whilst impressed so far, I'll edit in a couple of days with more results for a better opinion for you all. You can buy a full size, 60ml bottle of Shaveworks The Cool Fix for £11 from Birchbox. Meaningful Beauty is a brand that was created by supermodel Cindy Crawford and French anti-aging specialist Dr. Jean-Louis Sebagh. Dr. Sebagh calls this Glowing Serum his “models secret” and it is designed to provide a healthy, youthful glow by smoothing and conditioning the skin. It comes packaged in a small, white tube with a pump lid and a purple cap. It is quite minimalistic and has the brand and product name written across the tube. The serum is a pale yellow colour with no noticeable fragrance. The consistency is also good and easily spreads across the skin. The main thing that concerns me with this serum is its compatibility with oily skin. Anything that says it is going to provide a “glow" to me usually means to "approach with caution." However, I decided to try it out. My skin did feel a quite a bit oilier than usual after using it, and this was the case throughout the day. Therefore, I don’t think that this product is going to be well suited my skin type. However, whilst I haven’t given it a thorough road test and I can’t report back on much, there are a couple of bits that I did notice after just this short amount of time. Mainly, my skin did look brighter, but the glow for me was just a little too much. I may give this product more of a chance though and persist through the extra oiliness and report back, but if no further results are added to this section then the chances are that my opinion has stayed the same and my skin simply isn’t getting on with it too well. Alternatively, I may pass this sample on to somebody else and try to get some better results for you all! 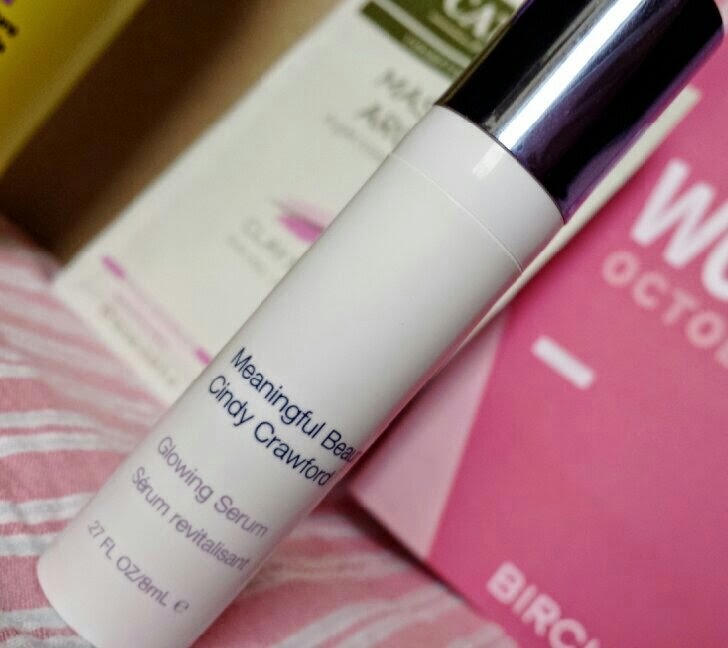 You can buy a full size, 15ml tube of Meaningful Beauty's Glowing Serum for £30.95 from Birchbox. 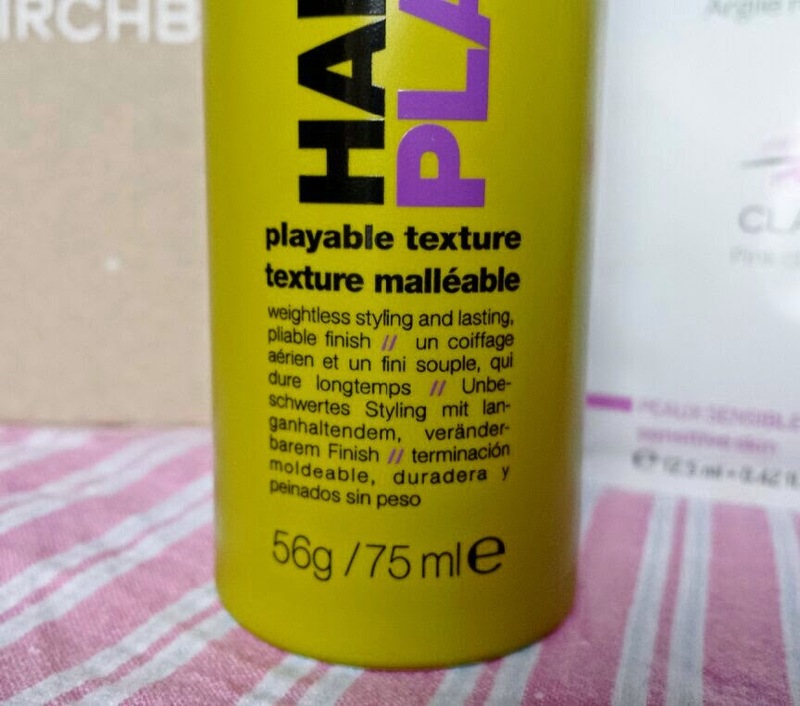 Hair Play is a hair spray that claims to provide volume, texture and hold, but is also re-workable. It also claims that it can be applied multiple times without any build up or stickiness, so it’s perfect if you can’t make up your mind when styling your hair! This is another product that worried me a bit straight off the bat - I have converted to “no-poo,” so I am really cautious of what hair products to use. However, this doesn’t seem to contain any of the ingredients that cause build up, so I think that I will be giving this a try. For now, though, I have given it a test run in my sisters hair. We tried it when her hair was wet and when it was dry. To use the spray you need to twist the cap anti-clockwise and press down on the cap. The spray has a really nice smell to it, so this was the first thing that we noticed. When applied to wet hair, my sister then went on to have her hair blow dried and straightened. The first thing that we noticed was that it provided her hair with a fantastic shine. However, she had just had her hair dyed, so whether the shine was due to the spray or the dye was difficult to tell. In regards to the style though, the spray added extra volume and hold. She could also mess it up slightly to add some texture and then brush it back down and then re-style again if she so wished. Then, we applied extra spray a while later to test. The product didn’t feel overly built up and didn’t look or feel weighed down. Again, it added more volume and texture and enabled her to give her hair a little something extra. Unfortunately though, just like me, she has pretty short hair. Therefore there is some difficulty in trying out too many styles as really short hair limits you quite a lot. I think that with longer hair you can probably have more fun and become more creative, but with short hair you can still achieve great styles such as a messy bob. Anything that requires some volume and texture as well as hold. 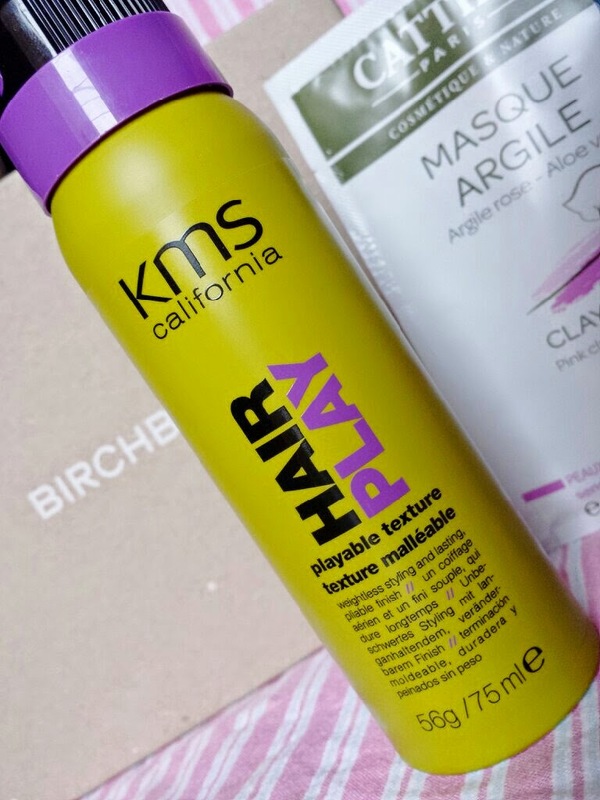 You can buy a full size, 200ml bottle of KMS California Hair Play for £15.50 from Birchbox. 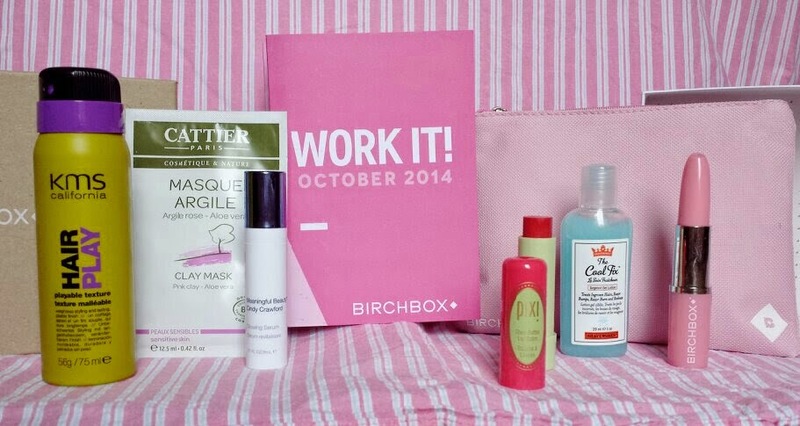 The lifestyle extra this month is a very handy Birchbox lipstick pen. If, like me, you tend to misplace pens all the time, receiving another pen is always a treat. I have to try and stash a pen in every place I may need one so I can skip the hassle of trying to find one (sometimes it works out, sometimes not), so this is a welcome addition. Overall I think that this is a pretty solid box. It isn't the best box so far, but I really love the theme and the cause. 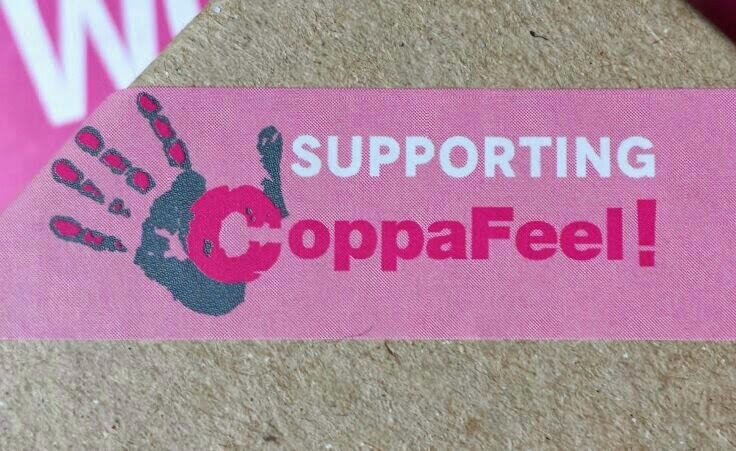 I also love the charity of Birchbox and the £1 donation for every #CoppaBirchbox photo and the fact that if you subscribe this month they will donate £1 for every new subscriber. 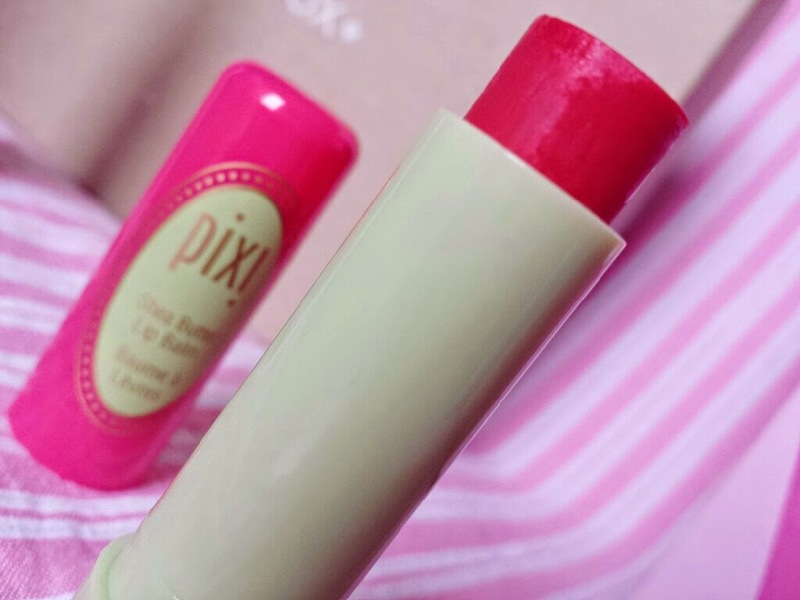 My top picks this month are the Shaveworks The Cool Fix and Pixi's Shea Butter Lip Balm. 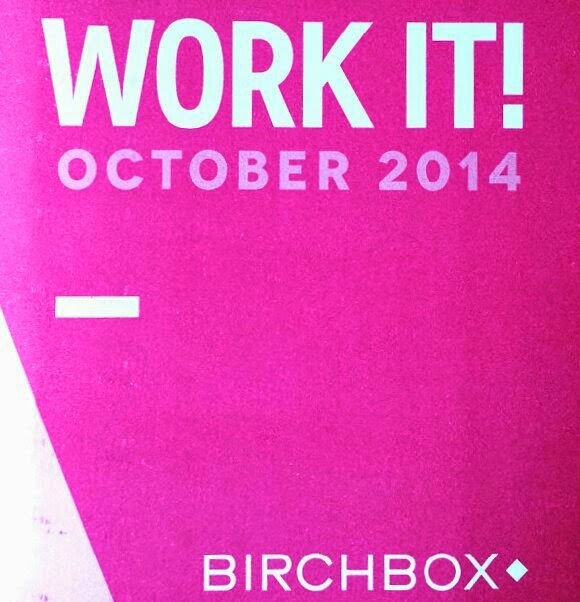 Whilst I'm quite happy with my Birchbox this month, I have sadly once again had another month of slow delivery. Has anybody else been having issues with delivery?